The Gospel is not for the hard-hearted. The Law is for the hard-hearted. When the rich man with a hard heart ran up to Jesus, Jesus didn’t give him the Gospel. He gave the rich man Law. How do we know the rich man had a hard heart? Because he tells us. He tells Jesus that he has kept all the Commandments of the Second Table from his youth; all those that deal with loving our neighbour. Jesus lists for him Commandments Four through Ten, and the rich man says he’s kept them. He says he has loved his neighbour perfectly in thought, word, and deed. That’s what a hard heart says. Jesus scratched at the scab of his illness. Oh, the illness was there alright. Jesus directs the rich man to the First Commandment. The rich man did not fear, love, and trust in God above all things. He feared the loss of his possessions. He loved his possessions. He trusted in his possessions. He did not fear, love, and trust in God above all things. Thus, he became sorrowful and disheartened. His face dropped and he grieved in pain. The words of Jesus hurt him to the core. He had great possessions and he did not want to give them up. He could not choose between following Jesus and his possessions. He could not choose between loving God above all things, and loving his possessions above all things. The man had run up to Jesus with excitement, confidence, and eagerness but departed from Him distressed and gloomy with his head hung low. He walked away from Jesus. Isn’t this the same reason people walk away from the church? The Law preached to them makes them distressed and gloomy. It’s painful to hear the Law piled up until it crushes their confidence in themselves. It’s such a downer for them to hear about their sinfulness and their many sins. The problem with the rich man was not that he became disheartened at Jesus’ words, or that he became distressed and gloomy. The problem was that he left Jesus. It was too painful to hear about his sins, so he left the physician of souls who alone can cure. This is the loving diagnosis of a physician to a sick and dying man who refuses to see the reality of his illness. Jesus has the eternal cure for our illness of sin, but without God’s Law showing us our sin, we will reject our sinful condition; we will reject eternal healing; we will reject forgiveness. We do not know who this rich man was or what happened to him after he left Jesus. There are speculations that it was Mark, the writer of the Gospel, or perhaps even Saint Paul, but these are unsubstantiated theories. The Holy Spirit has intentionally left us without this information. The information that we are left with is that if we think that we have fulfilled God’s Commandments to love Him with our whole heart and our neighbour as ourselves, we need only more Law piled up until we become disheartened and despair in ourselves. If we are asking what must I do to inherit eternal life, we need only more Law piled up until we realize that we are hopeless and helpless and can do nothing to save ourselves. Once Jesus has looked at us and loved us and piled up the Law on us, He does not leave us in our despair. Once the physician of our souls has diagnosed our problem and opened our eyes to recognize our need for His cure, He gives us the cure. That cure is the forgiveness of sins. This cure is only available from Jesus. Only Jesus has paid the price of your sins. Only Jesus has earned forgiveness for you by His suffering and death on the cross. Only Jesus has looked at you and loved you to the point of giving Himself into death for you. Everything has been done for you to inherit eternal life. Jesus has done it for you. Jesus kept the Law for you by fearing, loving, and trusting in God the Father above all things. Jesus kept the Law for you by loving His neighbour to the point of giving His life for all of us. Jesus wants you to despair of saving yourself, but not to despair of Him saving you. He wants you to fear, love, and trust in Him above all things, because He is your God and Saviour. Our souls are healed at His Word, so He causes us to love and trust Him. We love God because He first loved us (I Jn 4:19). Jesus showed His love for us by laying down His life for us, so we love Him and know that we can trust in Him for eternal life. Jesus looks at you and loves you, so He has His Law preached to you, so that He might then bind up your wounds which the Law has exposed, and give you His free cure of forgiveness. Those who are well have no need of a physician, but you who are sick rejoice in the forgiveness of sins Jesus gives to you. 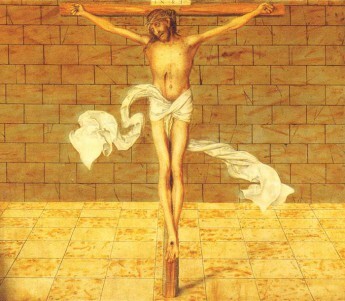 Jesus’ body and blood, given and shed for you give you the forgiveness of sins and eternal life. Jesus does not leave you in despair, but leads you through despair to Himself. He leads you through the gloom and disheartenment of sin to the joys of everlasting life. His hand that sends you sadness will turn your tears to gladness, for after grief God gives relief, your heart with comfort filling and all your sorrow stilling (from LSB 760 st. 2,5). The Gospel is not for the hard-hearted. The Gospel is for you who have been crushed by the Law. The Gospel is for you who desire the forgiveness of sins. The Gospel is the free forgiveness of sins Jesus earned for you and gives to you as a gift. If that does not lift you from despair and make you rejoice, nothing will. Amen.